We hope to welcome visitors from far and wide on Remembrance Sunday. We offer free admission to all on this very special day as we remember members of the Armed Forces who lost their lives in active service. As we commemorate the centenary of the outbreak of the First World War this year, many of our Remembrance activities have a First World War focus. From 10.30am to 2.30pm, explore our small replica First World War trench, located between the Flying Aircraft and Air and Sea exhibitions. Find out what life was like for the Tommies in the trenches. See how trenches would have looked at the beginning of the First World War in 1914. Moving through, you’ll see how different the trench experience was by the end of the war, in 1918. As you travel through the trench, you can handle objects that would have been used by the Tommies, including replica respirators. You’ll also be able to try on mini replica First World War uniforms, webbing and head dresses. In AirSpace between 10.30am and 2.30pm, we’ll be making poppies and wearing them with pride or attaching them to a large frieze depicting a First World War Flanders Field. In Land Warfare, between 10.30am and 2.30pm, we’ll be making poppies and attaching them to a frieze that represents contemporary warfare. In both AirSpace and Land Warfare, visitors will have the opportunity to write their own personal messages of remembrance and attach them to our pictorial friezes. At 11am, a two-minute silence will be observed across the museum, starting and finishing with a museum-wide whistle blast, in remembrance of the symbolic signal to go ‘over the top’ in the trenches of the First World War and the millions of men who died in battle. Join us in the Marshall Auditorium in AirSpace at 11.30am and 3.30pm to hear about Lives of the First World War, the online digital memorial to the millions of men and women who contributed to the British war effort during the First World War. Find out how you can discover, remember and share your First World War connections. Between 11.30am and 2pm, in Land Warfare, you can meet and chat to Royal Anglian Regiment veterans and Burma Star veterans. Also, try on camouflage gear worn by contemporary serving Royal Anglian Regiment personnel and handle military objects. 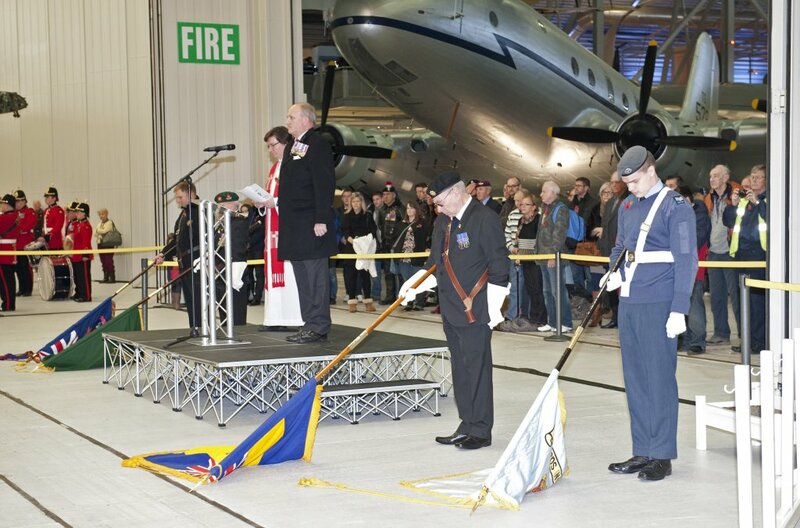 At 12.45pm, the Sawston Youth Group Band and RAF Cadets will march from the Hangar Base to the Conservation Hall in AirSpace, in preparation for our traditional Service of Remembrance at 1pm, which will also feature standard bearers from the Royal British Legion and ATC Cadets. IWM Duxford’s partner organisations will lay wreaths in honour of the fallen. The poignant choral piece For the Fallen will be performed by In Voco Parentis, the parents’ and friends’ choir of King’s College School. IWM Duxford’s replica memorial church is dedicated to all those who lost their lives while serving at RAF Duxford. It is open to visitors from 1pm to 2.30pm on Remembrance Sunday, for historical interest or quiet contemplation. BBC Radio Cambridgeshire’s BBC Bus will be at IWM Duxford on Remembrance Sunday. You can meet presenters Nick Conrad and Sue Marchant and try your hand at presenting. Go back in history with the BBC Bus experience – on the bus we will have real stories that effected Cambridgeshire during the First World War with a mini studio and videos ready. You can step back in time and become a war reporter, telling the news that made history.